Planted in the heart of Paris, we stand on the Left Bank of the Seine, looking upstream toward the wrought-iron Pont des Arts. A ferry pulls up to the quayside, crowded with commuters and idlers from all walks of life: leisured ladies in bright crinolines and smartly turned-out dandies, scrappy street urchins and soldiers in crimson trousers, romping dogs and a blue-smocked working man, seated on the riverbank. Up the ramp at right, secondhand booksellers trade in the shadow of the domed Institut de France, while on the horizon at left appear the brand-new theaters of the Place du Châtelet. The crisp shadows and liberally applied black are typical of Renoir’s early career, when the artist and his friend Monet set out to document their changing city in a celebrated series of views to which this one belongs. (Max Silberberg and Hugo Simon sale, Paris, Galerie Georges Petit, 9 June 1932, lot 25, ill., bought in at FF. 133,000). This crisp view of Paris on the Seine is one of Pierre Auguste Renoir’s first outdoor studies in a modern urban environment. Fashionably dressed Parisians enjoy a stroll; tourists stream on and off a river steamer decorated with the French flag. Along the bottom of the scene are the shadows of people on the Pont du Carrousel, which was just over Renoir’s head as he stood at his easel to paint this cityscape. Renoir’s painting can be seen as a celebration of Second-Empire Paris under Napoleon III, who reigned from 1852 to 1870. The city is clean, spacious, airy, and bright. Many Parisians were enjoying increased prosperity. 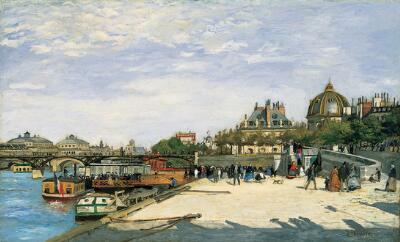 Renoir chose a view that reminds us of the prominence of culture in this period of urban renaissance. In the background on the right is the dome of the Institut, home of the Académie, the French art establishment. On the left, you can also spot the roofs of the newly completed Chatelet theaters. At the far right, Renoir included a poorly-dressed woman and two children. And at the left, a workman in a blue smock sits alone at the river’s edge. These small figures are subtle reminders that some people were not so fortunate in Napoleon’s new Paris. The sketchy figures, dancing light and contemporary subject anticipate Impressionism. In 1872, this canvas was purchased by Paul Durand-Ruel, the most influential art dealer in Paris. It’s the first painting Renoir sold to Durand-Ruel, who later became a major dealer of the Impressionists.